Maybe the most famous part of the Church of the Holy Sepulchre is a ladder that’s been propped onto the side of the building since at least the 1750s. The church is sacred to six different Christian sects, all of whom have to agree unanimously on anything in order to change any features of the church. For the past 250 plus years, none of them have agreed on where the ladder came from, who owns it, or where it should go. 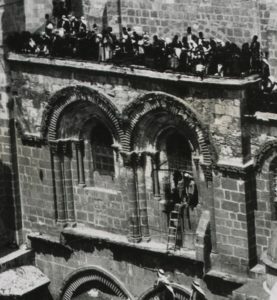 Tensions have occasionally led to fistfights at the Church of the holy Sepulchre, and the ladder remains a symbol of inter-sectarian non-cooperation.